Reserved Place: Is this really a great global recession? Is this really a great global recession? In a VoxEU column that attracted significant media attention, Eichengreen and O'Rourke (E&O) present evidence suggesting that the present global economic downturn is "every bit as big as the Great Depression shock of 1929-30" and "every bit as global". In contrast, this post presents an unconventional indicator of global economic activity that shows no sign of truly global recession yet. 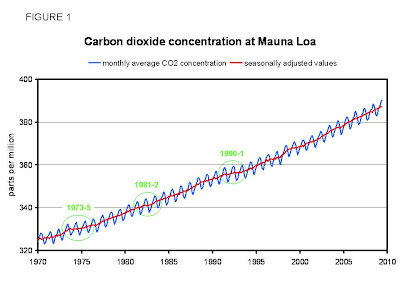 This indicator is the seasonally adjusted atmospheric carbon dioxide concentration at Mauna Loa, Hawaii. Admittedly, the rate of carbon dioxide emission varies between different industries, and atmospheric carbon dioxide concentration is affected by natural variables such as sea surface temperature, making it a noisy indicator of economic activity. Nevertheless, atmospheric carbon dioxide does have the advantage as an economic indicator that it covers the whole world equally well, including regions where official statistics may be unreliable, and it does seem to have reflected previous major global downturns, so the absence of such a signal so far should at least raise doubts about E&O's assessment of the present episode. The explanation for the disagreement with E&O may be that their analysis gives too much weight to activity in existing developed countries, and that the prominence of the downturn there belies an ongoing improvement in living standards of a vast number of people in poorer countries, especially in Asia, that is to some extent being sustained by stimulating domestic activity to substitute for reduced export demand. Like many who end up working in finance, RebelEconomist studied science at university, which in his case culminated in research investigating patterns in climatic records. Part of this work involved analysing the seasonal cycle in the well-known Mauna Loa record of atmospheric carbon dioxide concentration established by C.D.Keeling. This seasonal cycle arises because of the net absorption of carbon by plants during the summer (eg as leaves on deciduous trees) and release during the winter months, so that at Mauna Loa (20°N 156°W) the atmospheric carbon dioxide concentration normally peaks in early May and reaches a minimum in early October. Being driven ultimately by astrophysical forces and modulated by global scale environmental influences, the seasonal cycle is relatively stable and easy to model, and subtracting the seasonal cycle from the series isolates the underlying rise in the underlying level of carbon dioxide concentration that is the cause of concern about global warming. Even then, before he took much interest in economic events, RebelEconomist was struck by the marked dip in the upward trend of the seasonally adjusted series during and after 1973, apparently due to the first oil shock triggered by the Yom-Kippur-war-related Arab oil embargo and steep oil price rises (which was all the more marked because it had been preceded by a period of rapid economic expansion), as well as a less distinct deceleration around 1981 associated with another relatively severe downturn. Therefore, when RebelEconomist recently went back to the series to update his PhD analysis for a seminar celebrating his supervisor's research career, he expected to see a similar if not larger slowdown in the rising trend of atmospheric carbon dioxide concentration over the last few months, on the assumption that the present economic downturn is the most severe since the Great Depression. Instead, to his surprise, the updated seasonally adjusted series, based on observations up to and including May 2009 (Figure 1), so far shows no sign of decelerating at all. For the geeky reader, the seasonally adjusted series in Figure 1 was obtained by time-variable estimation of a trend plus seasonal cycle model. To be more precise, recursively updated least squares estimates of the model from a forward and backward pass through the series, with parameter variation modelled as an integrated random walk process, were combined to produce a series of smoothed parameter estimates without the lag in parameter changes that would exist in a series of estimates obtained from a single forward pass. More details of these techniques can be found in P.C.Young's "Recursive Estimation and Time-Series Analysis" (published in 1984 by Springer Verlag). However, the seasonal cycle in this series is sufficiently clear and stable that similar results could be obtained with almost any reasonable seasonal adjustment procedure. Although the analysis included the entire record back to 1958, the years since 1970 only are plotted, since over longer periods the relentlessly upward trend makes higher-frequency variations difficult to see. What might explain the absence of a recent slowdown in the rise of atmospheric carbon dioxide, in contrast to the 1973-5 recession? One possibility is that it is too early to expect the effect of reduced anthropogenic carbon dioxide emissions to reach a place as remote as Mauna Loa yet. On the contrary, the atmosphere is actually "well mixed" around each hemisphere, as the seasonal cycle at Mauna Loa shows by reaching its maximum not long after the end of the northern hemisphere winter, and its minimum close to the end of the northern hemisphere growing season. Also, the inflection in the upward trend around 1973 was practically contemporaneous with the beginning of that recession. Another potential explanation for the absence of a deceleration of the increase in atmospheric carbon dioxide now might be that variations of natural origin are either obscuring anthropogenic effects, or were the real cause of the dip in 1973-5. In particular, sea surface temperature (SST) has a notable effect on atmospheric carbon dioxide at Mauna Loa, because the solubility of carbon dioxide depends inversely on water temperature, although it is not exactly clear what sea area has the most influence on the air at Mauna Loa (situated in the north east trade wind belt), and whether in monthly average observations the SST effect should be most apparent in the level or the change in atmospheric carbon dioxide and with how much lag if any. It seems unlikely though that SST caused the 1973-5 deceleration – SST over the ocean around Mauna Loa (as represented by an average over a box from 0-60°N and 160-230°E of the US National Climatic Data Center’s Extended Reconstructed SST, version 3b) was not markedly lower in 1973 than earlier in that decade (Figure 2). 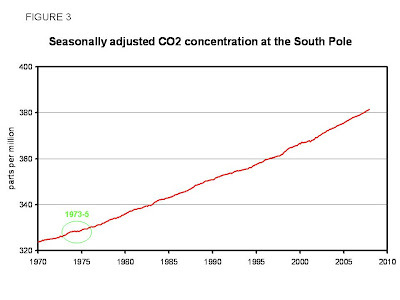 Moreover, a muted inflection in 1973 is also evident in the (less complete) record of atmospheric carbon dioxide concentration at the South Pole (Figure 3; the unadjusted series is not plotted in this case because the seasonal cycles are so small that they obscure the seasonally adjusted series). Also, as already mentioned, other smaller decelerations seem to coincide with major downturns such as those of 1981-2 and 1990-1. This association is evident in a weak positive correlation (about 0.1) between annual global real economic growth rates and the corresponding year's increase in the seasonally adjusted Mauna Loa carbon dioxide series over the period 1970-2008 (a longer series of quarterly observations of global economic growth rates could not be found; the greater availability of quality-controlled data in the environmental sciences – which honour the contribution of data compilers like Keeling – compared with in economics – which hardly does – is impressive). 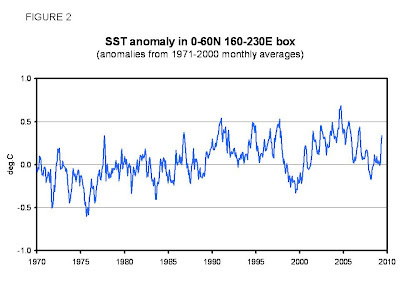 Certainly, regional SST cannot explain the absence of a current slowdown in the increase of atmospheric carbon dioxide at Mauna Loa; as Figure 2 shows, SST in the region has been generally falling since about 2004, and has not recently (at least until the last two months) been anomalously (relative to the 1971-2000 monthly averages) high. So, if natural processes and influences cannot readily explain the absence of a current deceleration in the increase of atmospheric carbon dioxide, could it be the case that the present recession is not as great and not as global as E&O would have us believe? Unfortunately, their attempt to compare this downturn with the Great Depression is restricted to variables for which observations covering both periods are available; namely, industrial or manufacturing production (their VoxEU column is not quite clear about which of these is presented), stock market prices and trade flows. Of these, only industrial production is a direct measure of economic output (and manufacturing production would exclude construction); stock market prices reflect expectations for future output as well as how that future output is valued by markets, and it is net trade that contributes to economic output (which matters more when different stages of production are carried out in different countries). In recent months, however, a wider range of domestic economic activity reports from developing countries in Asia, especially from China, have suggested that economic growth there has remained fairly robust, especially by developed country standards. In China, manufacturing for domestic consumption such as car production continues to expand rapidly, while fiscal stimulus has boosted infrastructure investment and it now seems possible that China will achieve its 8% target for economic growth in 2009. Recent economic statistics suggest that India's economy is presently stronger than expected, and next largest economy among the developing Asian countries, Indonesia, also seems to be performing relatively well. In conclusion, the absence of a slowdown in the increase in atmospheric carbon dioxide at Mauna Loa at the moment is inconsistent with the view that the present recession is globally severe, and this cannot be readily explained by known natural influences. Perhaps, rather than being a recession of "great" and "global" scale, the key characteristic of the present economic downturn is a shift of activity from the developed to the developing countries, and, aided by fiscal stimulus, into non-traded production such as construction and infrastructure investment..
Commenter Joao Carlos points out that the Brazilian economy (now one of the ten largest economies in the world) has also proved stronger than expected. Indeed, Brazil's "resilience" was specifically mentioned by Moody's credit rating agency yesterday as one of the reasons why Moody's have put Brazil's domestic and foreign currency sovereign credit ratings on review for an upgrade. Brazil's economy too is stronger than expected. So, more one developing country, but at South America and not at Asia, is behaving like you think. Thanks Joao. I noted your comment as an update to the post. The widespread and terribly sterile fixation on the Great Depression as a magnetic reference point for societal 'progress' speaks magnitudes more about post-war ideology than it does of economics. Very refreshing to see an attempt at a scientific end run around the cartel. are you certain the 1975-dip in the CO2-trend is really a dip? Looking at the enlarged Figure 3 I rather see an upward deviation from the trend starting around 1973 and then it goes back to the mean trend. Latter reversal could be perceived as dip. You also should consider El Nino/La Nina as possible cause for the wobbles in the CO2-curve. Looks like the ENSO-index inversely correlates well with the CO2-curve and their wobbles in the 70s (w/o having made the actual calculation). Thus, there is a good candidate for a natural cause of the "dip" in the CO-trend in 1975. In the recent recession years, we rather have had La Nina-conditions, i.e. higher release rates of CO2 from the oceans into the atmosphere. Anyway, the thought has been worth it to be tested, although there is a good possibility that you have mislead yourself. Assumption 1) is obviously not true for the US, and unclear for the world as a whole, but it is at least plausible that GDP can fall more than CO2 output if a smaller fraction of GDP is fossil fuel intensive than in earlier decades. Assumption 2) is almost certainly not true for the world as a whole due to advances in technology. With greater energy efficiency, the decline in economic output does not translate to a linear decline in CO2 output. This suggests seasonally adjusted Mauna Loa readings are becoming a less reliable indicator of recessions. Assumption 3) is very plausibly still true, but given concern about CO2 buildup perhaps the future of this assumption is also in doubt? As you say, the time series data may not exist to measure economic variables such as these, but that does not mean they can be ignored. Hey, brighty, your nonsensical post would make sense if higher levels of carbon dioxide are "only" attributable to man, i.e., they are anthropogenic in nature. However, and as some scientists claim, if higher levels of carbon dioxide are due to nature's own dynamics, then, your claim that world economic activity has not decreased is, at best, stupid. By the way, how, then, to explain all those millions of unemployed in, say, the U.S., Canada, Euroland, Russia, China...First and last time I read your silly stuff. Go, do some serious reading. If man-made CO2 emissions come from burning fossil fuels, then there is an easier way of checking: We "only" need to know how the consumption of fossil fuels has changed. As far as I know, worldwide oil use has dropped at least 5 % from its peak in late 2007 / early 2008. I don't think this sharp drop in oil use is disputed by anybody. Not sure about coal (and it's true that coal is used more intensively in emerging economies for which we have less data), but even the world's allegedly fastest-growing economy and biggest coal user worldwide (China) has reported that its total energy generation is up only slightly compared to last year, i.e. its coal use has presumably increased only a bit. So one would expect a dip in the CO2 levels if man is the primary driver of CO2 upward. Granted that these interrelationships are complex and no one datapoint can serve as a Rosetta Stone. I don't find anything particularly startling with the thesis that the major developing countries have been less affected by the West's (including Japan's) economic deterioration. A country like China has plenty of fiscal capital and the technological know-how to stimulate their local economy. Maybe the lack of a dip in the carbon emissions data is due to the nature of pollution control in these developing countries. Is it just possible that they use more inefficient production and power generation methods resulting in greater carbon emissions than we do in the West and thereby mask what should, given the dire production stats coming out of the West, cause a real dip in carbon emissions globally? I am not entirely sure what you mean, but I do think that the spectre of the Great Depression is sometimes used to justify policies that are driven more by political convenience than objective economics. In particular, we are told that unless monetary and fiscal policies are eased aggressively pre-emptively, the sky will fall. I am sceptical. For example, I suspect that it might have been better if Japan had allowed its equity and property bubble to deflate first, and then eased monetary and fiscal policy aggressively. It seems to me that intervening to stop asset prices falling simply leaves them at a level that is widely seen as unsustainable, so that various activities are postponed while awaiting the inevitable bust. Perhaps the cumulative output loss from, say, a 20% fall in Japanese GDP during a liquidation episode in the first couple of years of the 1990s followed by a return to normal growth would have proved less than the prolonged sluggishness that has actually occurred. If I understand correctly then, a low SST in the tropical Pacific rather than a high SST (as I expected) should be associated with larger increases in atmospheric carbon dioxide, because carbon dioxide is being released as upwelling cold water is heated. But I may not be able to see this relationship with my SST because the area I chose includes the north Pacific too. I must say though, that contrary to the account given in your second link, atmospheric carbon dioxide was actually increasing relatively rapidly during most of 1998, as can be seen in Figure 1. Similarly, the 1973-5 period of relatively slow increase in atmospheric carbon dioxide was a cold MEI spell. While you are right that the 1973-5 deceleration follows an acceleration, that is not inconsistent with economic events. 1972 and 1973 are the years with the highest global economic growth rates in the series I used ( http://www.ers.usda.gov/Data/Macroeconomics/Data/HistoricalRealGDPValues.xls ) – an expansion known in Britain as the "Barber Boom", after our finance minister of the time. It seems that the natural and anthropogenic influences on carbon dioxide are difficult to resolve. Note also that the correlation between the annual increase in carbon dioxide and the annual global economic growth rate is no less positive if the period from 1973-5 is excluded. I appreciate that the relationship between carbon dioxide and economic output is evolving for various reasons, but I am assuming that this process is gradual compared with the fluctuations of economic growth itself. No doubt developing industrial countries emit more carbon dioxide per unit of GDP, so the absence of a deceleration in atmospheric carbon dioxide may still be consistent with a overall economic downturn as rising output in developing countries does not entirely offset the fall in output in developed countries. But it does suggest that the downturn is (a) patchy and (b) not globally severe. I agree it is reasonable to assume the change in the relationship between CO2 emission and economic output is a smoother process than the fluctuation of economic output. But the question is not one of how smooth is that change, but of how large it is over a period of years or decades. A progressive decrease in CO2 emission per unit of economic output over time resulting in a smaller measurable deceleration in total CO2 concentration is consistent with your own plot of south pole CO2, in which the earliest inflection is also the most noticeable. Given all the non-anthropogenic noise and the seasonal effects, the CO2 measurement has always been too crude to detect any but a severe and possibly lengthy (more than one year?) decline in global output. Therefore, wouldn't we have to have a severe and lengthy slowdown to establish (or refute) conclusively the continued sensitivity of the CO2 measurement to a slowdown? In other words, given uncertainly about the changes in fossil fuel utilization per unit of output, while a measurable deviation from CO2 concentration trend would strongly suggest the present downturn is of comparable severity to the reference downturns, the absence of a noticeable deviation does not prove this downturn is not similarly severe. I am less satisfied with your remark about the downturn perhaps being merely patchy rather than global, given that you rejected the possibility of a lag until we observe the CO2 deceleration on the basis of the atmosphere being well mixed. I loaded in CO2 values from Mauna Loa since 1960 and used year over year smoothed, seasonally adjusted numbers. From the beginning of recessions to the end, CO2 growth rates dropped an average of 0.15% and then rebounded by an average of 0.09% in the 12 month after the recession ended. 1980-1982 dropped 0.21% and then rebounded 0.27%. The 1990 recession had no real pattern. In 2001, the drop was 0.04% and the subsequent 1 year rise was .21%. So far, using the same data series, the CO2 rate has dropped 0.15% which is the same as the average of all recessions since 1960. So, I agree that CO2 is a marker for recession but I disagree with you because the rate of increase has clearly sloed between November 2008 and now. Anonymous (08 July 2009 10:22), just in case you take a peek to see my response to your comment! It is not necessary for anthropogenic emissions to be the only source of increases in atmospheric carbon dioxide to use that as an economic indicator. It just has to be possible to resolve anthropogenic from natural influences. Having seen a little of how the academic establishment works in controlling journal publication and allocating research funding, and being a natural (or perhaps that should be "anthropogenic") sceptic myself, I have some sympathy for those who suspect that scientists who doubt the importance of (a) the anthropogenic contribution to atmospheric carbon dioxide and (b) its contribution to global warming are being suppressed by the scientific establishment. But I do think that it is beyond doubt that mankind has short-circuited the carbon cycle on a massive and unprecedented scale (ie a fraction of the Earth's carbon that would naturally be locked up in coal, oil, gas, forests, soil humus, and maybe even calcium carbonate, is being shifted into the atmosphere in the first instance), so it is not unreasonable to expect some environmental changes as a result. And since life has adapted to the world as it has been, life seems unlikely to be a net beneficiary of such change. So I think it is right to err on the side of caution. In practice, that would mean that, unless it can be established that taxing carbon dioxide emission is more of a drag on economic activity than, say, taxing income, I would favour shifting the burden of taxation onto carbon taxes even if doubt does remain about the climatic impact of using fossil fuels. And that is even before considering other potential negative externalities of using fossil fuel such as ocean acidification, pollution (sulphur dioxide, NOx etc), depletion of petroleum for other uses (eg petrochemicals) and the risk of depending on politically unstable or hostile countries, etc. While fuel consumption statistics could in principle be used to determine anthropogenic carbon dioxide output, in practice they may not be any more reliable than official direct measurements of economic output. The Chinese electricity generation report you mention is a case in point. It was seen by some analysts as a more trustworthy indicator of Chinese economic activity than the official GDP figures, but – perhaps for that reason – ceased being published in May. Nevertheless, I read that reported Chinese electricity demand was distorted by price controls and subsidies that prompted generating companies to reduce supply (eg by undertaking power station maintenance) when the mandatory price of electricity was unprofitably low relative to coal, and some manufacturers to generate their own electricity when generator fuel was cheap relative to electricity. I see what you mean, but assuming that the underlying rise in atmospheric carbon dioxide is of anthropogenic origin, I think you are mistaken. If economic activity used, say, one barrel of oil per hundred dollars of GDP in 1960, and one barrel of oil per thousand dollars of GDP (at 1960 prices) in 2009, a ten percent decrease in GDP in either year will produce a ten percent decrease in carbon dioxide emission. Although this may be numerically smaller in 2009 than it would have been if GDP had not become more carbon intensive, it is just as noticeable, because the increases in the underlying level will also be smaller. You are correct that the 1973-5 dip is the most pronounced though. This may be because the effect of the oil shock coincided with a La Nina / El Nino episode (as rootless cosmopolitan pointed out in his comment), or perhaps because the economic impact was largely caused by an oil supply shock. By "patchy", I mean that some economies are still growing while the ones that English language economic bloggers are most familiar with (ie US, Europe and Japan) are contracting painfully, which is how our deep recession can coexist with a mild slowdown for the world as a whole. I do not see the relevance of lags. I am not sure what you are measuring though. I would have expected a recession to be associated with a slower rate of increase in atmospheric carbon dioxide right through the recession, not a declining rate of increase (perhaps I was unwise to use the word "deceleration"). So the test should be what the average increase was during a recession compared with what it was before and after. Using my seasonally adjusted series, the average monthly rate of increase was 0.019 ppm per month during the period November 1973 to March 1975 (the NBER recession period), compared with 0.141 ppm per month in the preceding year and 0.123 ppm per month in the following year. By contrast, the monthly rate of increase has been 0.140 ppm per month for the period November 2008 (the date from which you consider the rate of increase to have "clearly slowed") to May 2009, compared with 0.145 ppm per month for the preceding year), which I would describe as "barely slower". Where did you get your seasonally adjusted series from? I would also ask what you are using to date the beginning and end of the global recessions – I am not aware of any global equivalent of the NBER business cycle dating committee. Interesting article. One alternative explanation that leaps to mind is the "positive feedback effect" which certain climate scientists fear could result from manmade CO2 emissions. For example, as temperatures warm, Siberian tundra melts, organic material inside it which has been frozen solid for thousands of years, begins to decay, and the decay releases more C02, which causes more warming, and so on in a "vicious cycle". If these theories are true, then the difference between measured and expected CO2 in Mauna Loa might be explained by natural sources giving off more carbon than they have in previous decades. These positive feedback cycles have not been set in motion since the dawn of recorded history, so the past correlation of carbon vs. economy might not be a good predictor of future gains (as they say on the stock market). Even if the climate has not hit the "runaway out-of-control" level of positive feedback, which some scientists fear, a small positive feedback might produce sufficient additional natural carbon emissions as we approach the "tipping point", to invalidate your assumption that CO2 tracks economic activity. My point was merely that the Depression holds a very lofty position in the post-war moral order - as witnessed by the regular and pointless measuring of the current bad outcome against it, or even that an expert in the matter would rise to the top of the Fed. This probably skews analysis of the present, and therefore policy, in unpredictable ways. In other words, it is nice to see a data point (for all its inconclusiveness and limitations) that does not proceed from the Depression economics toolkit. You say that "If economic activity used, say, one barrel of oil per hundred dollars of GDP in 1960, and one barrel of oil per thousand dollars of GDP (at 1960 prices) in 2009, a ten percent decrease in GDP in either year will produce a ten percent decrease in carbon dioxide emission." I emphatically disagree. While this might be true if all types of activity fell in lockstep 10% as aggregate output fell 10%, generally speaking nothing of the sort occurs. Let's consider two example economic activities, one carbon very carbon intensive, one not, and evaluate the considerable problems each presents for holding up an assertion that CO2 output should decline 10% when economic activity declines 10%. For a carbon intensive activity, consider passenger air travel, surely a high octane segment of the transport sector. As passenger demand falls, first ticket prices drop. For instance, the London to NY flight uses about as much fuel to make the trip regardless of how much the passengers paid on average, so that airline revenue (for this flight) can fall 10%, 20%, 30% or more while CO2 output falls none. In fact, even when the plane flies half-empty the fuel savings is not very much. The airline does not trim its schedule (reducing available seat miles, and with it, finally, CO2 output) until somewhat later, perhaps when marginal revenue falls below marginal cost. How much does passenger aviation industry revenue have to fall before available seat miles decline 10% (at which point CO2 output might decline 10%)? I do not know, but I will bet it is well above 10%. Maybe an aviation analyst can tell us. The airline example is typical for many carbon-intensive economic outputs. Much of the infrastructure that consumes fossil fuels continues to operate until marginal revenue falls below marginal cost. Industry revenue may have declined materially before any equipment is idled. In some sectors such as ocean freight transport, the revenue swing mught be very large before ships get pulled from service. For a less carbon intensive industry, consider law. Does anyone believe a 10% decline in billable hours results in 10% less CO2 output? In fact, the carbon footprint of the legal sector does not drop too much until many lawyers stop driving to the office. Much of the service economy is similar. Finally, the same is true in the household sector: miles driven and home energy use (the main sources of CO2 output) may fall, but do not plummet linearly with a decline in income. If we consider the microeconomic factors that drive decisions about whether or not to continue a CO2 producing activity, it becomes evident that by the time anthropogenic CO2 output in a modern economy drops 10%, GDP may have dropped substantially more. 1) Again, the measurement is no longer sufficiently sensitive to spot a major economic downturn at all due to the changing relationship between economic output and CO2 output. I do not see that we have really addressed this objection yet. 2) Lags ARE important, because output declines (in dollars) may have to be sustained and/or extremely acute before anthropogenic CO2 output falls measurably. It may be too soon for a conclusive result. 3) As you suggest the measurement can perhaps only most reliably detect an oil-shock based downturn. While an observable change in CO2 buildup could provide evidence a major downturn of some sort has occurred, the absence of the observation does NOT disprove a downturn of similar magnitude (but of maybe a different nature) has occurred. 4) The measurement was never adequate to spot a major downturn, and only coincidental natural variation led to the analysis suggesting otherwise. I remain skeptical of this evidence that we do not have a very severe global downturn in progress. It might be true that some places, such as China and Brazil, have been less impacted to date, but the CO2 evidence regarding global downturn severity is really inconclusive. Thanks for the continued discussion, Ray. I agree that it is unlikely that all economic activity falls in lockstep, and I can see that your airline example would produce a less than (say) 10% fall in carbon dioxide emission for a 10% fall in GDP (assuming that it is passenger miles that contributes to GDP rather than flights of course), but in the absence of evidence of which activities get cut first, I think that 10% for 10% is a not unreasonable assumption. You could be right that airlines keep flying until the passenger numbers fall by a certain amount; on the other hand, a small fall in passenger numbers might be the straw that breaks the camel's back and produce a disproportionately large fall in flights. Without evidence, we cannot say for sure. I must say, though, that it seems to me more likely that the marginal activity is carbon intensive. As you know, public sector activity tends to be the least cyclical, and I dare say that public sector activity is relatively low in carbon intensity (eg administration, education, healthcare etc). That would suggest that if the public sector share of GDP has expanded, the elasticity of carbon emission with GDP has actually increased. Anyway, I think you set the bar too high. I am not saying that I expect a deceleration in the rate of increase of atmospheric carbon dioxide of a certain size; I am saying that there is no clear sign of any deceleration, which at least justifies the question posed in the title of this post. I doubt that lags can explain the lack of deceleration. The essence of a recession is surely not just that unsold inventories are piling up and that producers and consumers are losing confidence, but that activity has actually fallen – factories reduce output and close, ships do not sail and concrete is not poured. And, as the seasonal cycle at Mauna Loa shows, carbon dioxide emitted anywhere is mixed at least around its own hemisphere within a few weeks. If there is an explanation for the absence of deceleration other than that the severity of the present downturn is being exaggerated, it seems most likely to be that natural influences drive at least the short-term variations in atmospheric carbon dioxide, including as rootless cosmopolitan argues, the 1973-5 dip which gave me the idea to use atmospheric carbon dioxide as an indicator of global economic activity in the first place. I shall build the ENSO index that rootless cosmopolitan suggests into the model to see how much of the variation it can explain, and report back in a few days. I would not write too much over here, but I would say that the present global recession is greater in impact as compared to great global recession of 1928 -29. Because at that time people were not directly affected by this but now the people all over the world are affected by it. Your comment is welcome even after a while, although I disagree with it. I have done a bit more research since the orginal post which suggests that atmospheric carbon dioxide concentration is less sensitive to economic activity that I had expected, but it is true that emerging economies, especially China, have continued to grow strongly. Emerging economies may not have escaped some impact of the present economic downturn, but they are certainly not depressed or even in recession. And even countries which are supposed to be the epicentre of the slowdown, such as the US and UK are expected to grow at least a little later this year. It is hard to argue that this downturn so far is as severe as the 1930s depression.